In connection with Marcin Rey's report entitled 'The activity and connections of the Open Dialog Foundation', published on 14 August 2017. I confirm that due to the onset of the Russian occupation of the Crimea in March 2014, my brother left Sevastopol for Poland together with his closest family, including his current wife. He is now staying in the US. His return to the Crimea is not possible at the moment. In December 2014, he was not in Moscow with his wife – that was in 2013. A manipulation occurred: the photographs then published by his wife come from an earlier period. On the same day, she also published photographs from many other places which they had visited earlier on , , , . The publication date does not have to correspond to the date of the visit. 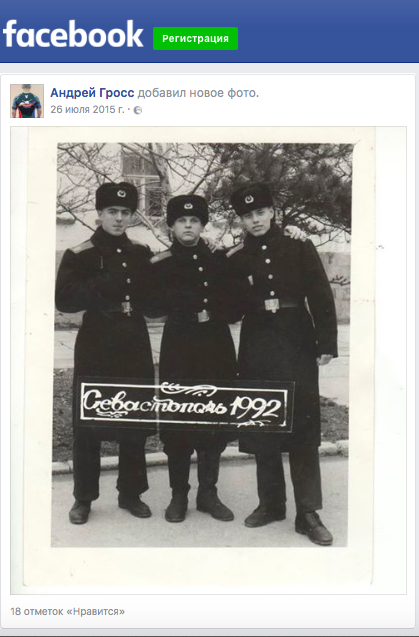 His wife in the photograph from Moscow is not pregnant, etc. This is a misstatement. Petro Kozlovski sold, in 2003, all of his shares in “Sevastopolskiy Majak”. Hence, the events attributed to him, concerning, inter alia, the eviction of tenants from company flats do not pertain to him at all. Telecommunications – Internet connections and VOIP telephony – became his principal business. Regardless of what Russian registers may indicate now, my brother is not exercising actual control over any businesses in the Crimea. The businesses and infrastructure he had owned were unlawfully taken over by the occupation authorities in 2014. He is making efforts in the international forum to recover the lost assets or obtain due compensation. The details of these actions are confidential. The data made available by the occupation and federal authorities should be treated with limited trust. Many items of information could be automatically copied from Ukrainian archives. By the same token, the Russian administration are issuing passports to all residents of the peninsula whose particulars they have – often without their knowledge and consent. Russia considers me and my brother to be their citizens but we have no say on that. It is to be emphasized that Russia is not a state governed by the rule of law and the criminal structures that are connected with the ones in power and which counteract one another have a huge influence on the functioning of the Crimea on a daily basis. Both old and the newly coming ones. No ownership rights are respected in these realities, any documents are made up, special services are not subject to any control and business assets change hands. Regrettably, even though to a smaller extent, that too was a problem during the Ukrainian administration – before 2014. It is worthwhile to take that into account when analysing company ownership and business connections. Before the occupation, my brother supported various Ukrainian social and political initiatives, such as the Orange Majdan and Yulia Tymoshenko’s Block. He never financed the Svoboda party though. Neither has he anything to do with the Russian Pensioners for Social Justice party. We have no influence on the decisions and choices of other, grown-up members of our family who have remained in the Crimea. This is clearly true also of his former friends or business partners. The occupation has changed life circumstances completely and divided Crimea residents breaking up many families. Petro Kozlovsky had supported the Polish community of Sevastopol for many years beginning from 2006. That bore no relation at all to the then or current political views of its activists. I also assume that – as is the case of other non-democratic countries on on the territotories they control – it must be particularly cautious in its activities now. Neither me or my brother have any direct connections with that, however. I am aware though that the recent confusion around our Foundation has led to numerous interrogations of, inter alia, the elderly leader of the Polish community Tatiana Gornostayeva by the FSB. I am afraid this has had a negative effect on her health. She is now in a severe condition, in a Sevastopol hospital. Due to his health condition (including problems with his eyesight), my brother never served in the Soviet or Ukrainian armed forces. Contrary to the unreliable information, he had never been in the marines. Thus, Andrej Gross is not his marine mate. He is not in the photograph to which Marcin Rey’s report refers. There are other people there. Petro supported the Open Dialog Foundation financially and encouraged others from his circles to do it. I had been abroad at the time for a long while and had no direct contact with him. It is to be emphasized that it was about Ukrainian citizens were guided by patriotic motivations like many Ukrainians at the time. This is also true about the people now reported on sensationally by Polish media. No “transfers from Russia” of that sort would be possible because of the restrictive law there, for that matter. Yes, our Crimean donors were disclosed for several years in the reports and the Russian services could probably check that. There is, however, a very significant difference between the information contained therein that the support was provided on a one-off basis in 2013 (that is before the occupation) and the journalists’ words that the money is continuing to flow. The same is true of the difference which is the daily references to their names and discussing in detail their alleged connections on the main TV information channels. Such lies and an artificially exaggerated interest are simply dangerous for some. This is all I have to say on these matters. My brother does not speak in public.